Health Care Costs New Threat To U.S. Military Defense Secretary Robert Gates says pension and health care costs are eating the U.S. military alive. And the Pentagon predicts that the cost of taking care of its troops and retirees will keep growing. Defense Secretary Robert Gates has sought to raise rates on military health insurance paid by working-age retirees. This week, he spoke to troops at Forward Operating Base Walton in Kandahar, Afghanistan. Defense Secretary Robert Gates says pension and health care costs are eating the U.S. military alive. And the Pentagon predicts that the cost of taking care of its troops and retirees will keep growing. Retired Maj. Gen. Arnold Punaro gets a lot of hate mail, because he's talking about something a whole lot of people don't want to hear about: the rising costs of military health and pension benefits. "We in the Department of Defense are on the same path that General Motors found itself on," he says. Punaro, a former Marine, is a member of the Defense Business Board, a group that advises the Pentagon on its financial operations. "General Motors did not start out to be a health care company that occasionally built an automobile," he says. "Today, we're on the path in the Department of Defense to turn it into a benefits company that may occasionally kill a terrorist." And Punaro is not alone. Secretary Gates sees the problem, too. He flagged it in March, during testimony to a congressional budget panel. "The Defense Department runs the risk of the fate of other corporate and government bureaucracies that were ultimately crippled by personnel costs," he said, "in particular, their retiree benefit packages." Here's what Gates was talking about: In the past decade, military health care costs more than doubled. They account for $52.5 billion in next year's proposed budget. Retirees' pay represents another $50 billion or so a year. People once worried that the cost of a fighter jet or bomber program would devour the military's budget. Now those concerns rise over health and pension costs — the same things civilians are struggling with, Punaro says. "Teachers are under fire. Government workers are under fire," he says. "Big corporations have walked away from these kinds of pensions and deferred compensation benefits because they're unaffordable. And right now, the last bastion of this is in the Department of Defense." Let's zoom in on health care. Gates says the average federal worker who is not in the military pays about $4,000 a year for family coverage. The military has its version of health insurance. It's called Tricare. "The cost of Tricare for a family, for a year, is $460," Gates says. That is, $460 is the annual fee for working-age retirees — the group Gates has been trying to get to pay a little bit more. But it's not easy. Just as GM had a union to contend with, Gates has his own challenge: Congress. He spoke about his efforts last month at the American Enterprise Institute. 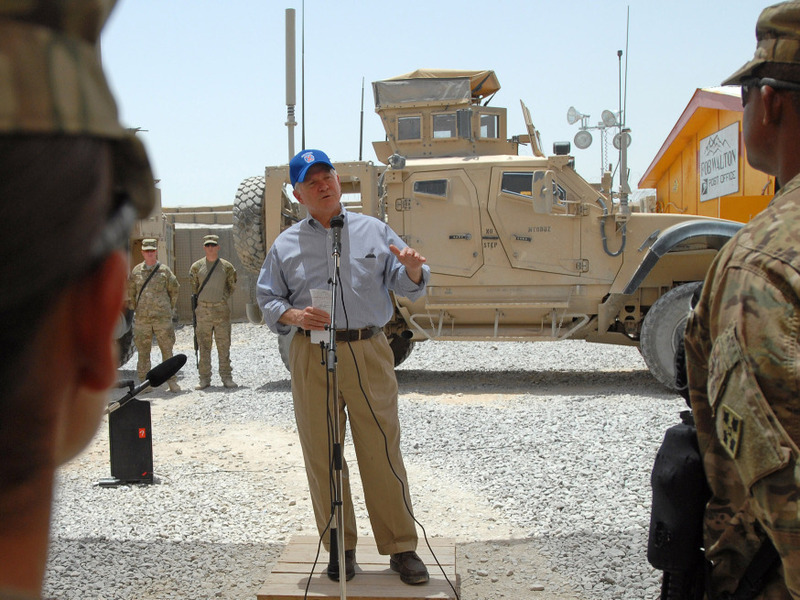 "The first two years I was in this job in the Bush administration, I went up to the Hill dutifully each year with a request for a tiny increase in the fee for Tricare and got my head lopped off," Gates said. "And so the third year, I didn't try." But, as Gates recently told NPR's All Things Considered, now he's trying again. "We are asking for the radical change of moving it to $520 — two-and-a-half bucks a month." Actually, it's $5 a month for family coverage. Still, Gates is running into resistance, from people like retired Air Force Maj. Joe Davis, a spokesman for the Veterans of Foreign Wars. "When people talk about $5 a month being reasonable — yes, it's reasonable," Davis says. "It is reasonable. But the thing is: What comes next?" You can't compare military benefits to benefits in the civilian world, Davis says, because the career of someone in the military is often so much harder. "In that 20 years, you have the possibility of picking up your entire family and moving about a dozen times," he says, adding, "Oh, by the way, you're going to war. Your spouse will never be able to really have a career, because you're relocating all the time." Retired Air Force Col. Steve Strobridge, the director of government relations for the Military Officers Association of America, says those sacrifices represent "a way steeper price than the $460 or $520 a year." The Department of Defense "only looks at what the benefit to DOD is, and how much military people are costing them in dollars," he says. "They forget — and don't put any value on — what it has cost the people to serve." Veterans groups say if the Department of Defense wants to cut costs, there are many other ways to do it.